Finishing third in the American League East did nothing to diminish what Tampa Bay accomplished in 2018. Perhaps the most pleasant surprise in baseball, the Rays won 90 games to end a stretch of four consecutive losing seasons. The combination of trades and shrewd drafting during their recent downturn helped replenish a system that finished the year with the Minors' best winning percentage (.604). "We do an amazing job here," Rays director of Minor League operations Mitch Lukevics said. "Obviously, we don't have the same resources as the Red Sox or Yankees, so we lean heavily on developing our talent. It's even more important for us that our prospects stay the course and crawl up that ladder to success." Entering his 24th season with the Rays, Lukevics oversees a farm that rates among baseball's best. Tampa Bay has five of MLB.com's Top 100 Prospects, led by 17-year-old Wander Franco, who checks in at No. 14 overall. Even the loss of their preseason top prospect, Brent Honeywell, to Tommy John surgery couldn't slow the Rays system. All seven domestic affiliates finished with winning records and two -- Triple-A Durham and Class A Bowling Green -- won their league titles, while two more reached the Finals. Not surprisingly, Tampa Bay was honored with the 2018 MiLBY for Best Farm System. Catcher -- Ronaldo Hernandez, Bowling Green (109 games): Hernandez showed that his strong stateside debut with Rookie-level Princeton in 2017 was no fluke. The 21-year-old established career highs across the board this season, batting .284/.339/.494 with 21 homers, 79 RBIs and 10 stolen bases to earn Midwest League midseason and postseason All-Star honors. 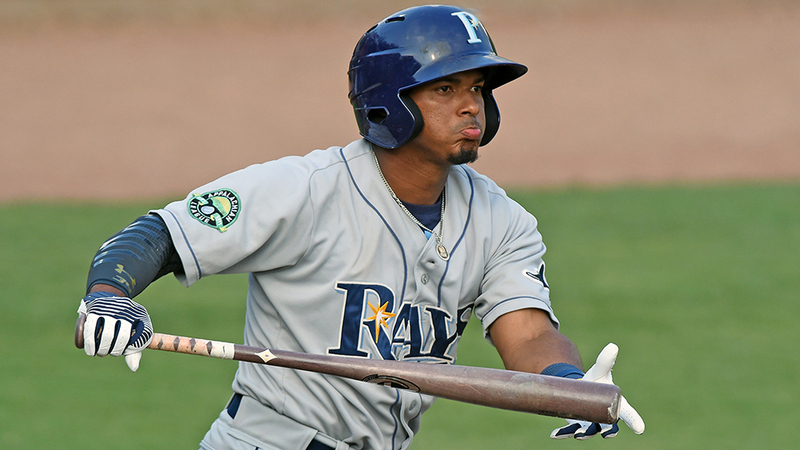 Although the seventh-ranked Rays prospect is still raw defensively -- he committed eight errors and allowed 19 passed balls -- Hernandez threw out a solid 36 percent of would-be basestealers in 85 games behind the plate. "He had a very solid year. And he's got one of the best attitudes you'll ever find in a player," Lukevics said. "He cut through the highs and lows like a true pro, and I think that type of demeanor is what separates him from other players. We were able to get him out into the Arizona Fall League for a bit at the end, which was a nice end to his year. Everything was very positive for him." First baseman -- Nathaniel Lowe, Charlotte (51 games), Montgomery (51 games), Durham (28 games): Barely two years after he was selected in the 13th round of the Draft, the 23-year-old Mississippi State product is knocking on the door of the Majors. Lowe slugged his way through Class A Advanced Charlotte and Double-A Montgomery -- with a stop at the All-Star Futures Game along the way -- before reaching Durham on Aug. 8. Although International League pitchers were able to cool off the Rays' No. 13 prospect, he finished the year with a .330/.416/.568 slash line, 60 extra-base hits -- including 27 homers -- and 102 RBIs in 130 games. "He came into Spring Training a different player," Lukevics said. "He took full advantage of last offseason, had a great spring and started hitting from the first day of camp and never stopped. Not too many Minor Leaguers drive in 100 runs anymore, so it was a tremendous year for him. Nate's a good worker with good character who is turning into a very strong player for us." Second baseman -- Vidal Brujan, Bowling Green (95 games), Charlotte (27 games): Brujan entered his first full-season campaign at 20 years old and showed star potential in a breakout 2018. The 12th-ranked Tampa Bay prospect hit better than .300 in 95 games with Bowling Green and spent the last month of the season tearing up the Florida State League. Overall, he batted .320/.403/.459 and led the Minors with 112 runs scored while amassing 41 extra-base hits and 55 stolen bases in 122 games on his way to a Midwest League postseason All-Star spot. "Vidal grew up, both mentally and physically this year," Lukevics said. "It carried over into his ability to play the game, which he plays with a high intensity. He's got a high motor and it's fun to watch him out there. I think he, out of all of our Latin players, made the most progress in his maturity and it showed with the numbers he put up." Third baseman -- Kaleo Johnson, GCL Rays (47 games), Hudson Valley (nine games): Johnson may not elicit the same hype as other players in the organization, but the 22-year-old started his professional career with a bang. Selected in the 32nd round in June out of Montana State University, Johnson excelled in the Rookie-level Gulf Coast League. He batted .311/.400/.539 with 22 extra-base hits and 25 RBIs in 47 games to earn a brief cameo with Class A Short Season Hudson Valley. He struggled a bit in the New York-Penn League stint, but it did nothing to mar an otherwise strong debut. Shortstop -- Wander Franco, Princeton (61 games): At an age when most kids are finishing high school, Franco was cementing himself as one of baseball's best prospects. After turning 17 on March 1, he went out and won Appalachian League Player of the Year honors for Rookie-level Princeton, despite being the youngest player on the circuit. The native of the Dominican Republic put together a .351/.418/.587 slash line with 28 extra-base hits and 57 RBIs, which tied for tops in the league with Bluefield's Alejandro Kirk. Perhaps most impressive was Franco's discipline and approach at the plate -- he finished with 27 walks and 19 strikeouts in 273 plate appearances. He's also drawn praise for his defense, where the 5-foot-10, 189-pounder has a quick first step, soft hands and a strong arm. "What can you say? When you're 17 and an MVP of a league, it says a lot about you and your skill," Lukevics said. "This kid is the total package and at that age, he's so much more mature than he has any right to be, which is key. He signed with us and had all the physical tools but what was most amazing was his level of maturity. If the mental doesn't equal the physical, it generally will short circuit a player at some point. We don't have anything to worry about in that respect with Wander. Man, what a player." Jesus Sanchez, Charlotte (90 games), Montgomery (27 games): Sanchez's season was impressive enough in any context, but finishing as a 20-year-old in Double-A has Tampa Bay thinking big. The lefty-swinging, righty-throwing outfielder participated in the Futures Game after running through the FSL to the tune of a .301/.331/.462 slash line. The system's fourth-ranked prospect stumbled in his final month with Montgomery, where he was one of the Southern League's youngest players. Despite the late-season hiccup, Sanchez batted .282/.324/.433 with 45 extra-base hits and 75 RBIs in 117 games and was added to the 40-man roster last month. "Jesus was great [in Charlotte]," Lukevics said. "He didn't do quite as well in Double-A, but the physical tools and mental ability are both there. He's got excellent skills and we're expecting big things from him. The Minors are all about having the potential to perform whereas the Majors is about performance itself. He's got the size, skill and mental approach to be special." Moises Gomez, Bowling Green (122 games): Gomez spent 2018 excelling in the Midwest League as a 19-year-old after consecutive years in the Rookie-level Gulf Coast and Appalachian leagues. The Venezuela native bypassed Hudson Valley and earned midseason and postseason All-Star accolades. He was one of the younger players on the circuit yet led the league with 82 RBIs, 34 doubles and 60 extra-base hits. He finished fourth with 19 homers and batted .280/.328/.503 in 122 games from the heart of the Hot Rods lineup. Jordan Qsar, Princeton (40 games), Hudson Valley (22 games): Qsar's coming from a renowned collegiate program -- Pepperdine -- seemed to pay dividends for both him and the Rays, who selected the 23-year-old in the 25th round in June. He began his pro career in the Appy League, where he was among the leaders in numerous offensive categories during his 40-game stay. Qsar compiled a .350/.471/.672 slash line while producing 21 extra-base hits, including 10 homers, and 32 RBIs before his promotion to the New York-Penn League. Utility player -- Brandon Lowe, Montgomery (54 games), Durham (46 games), Tampa Bay (43 games): The Rays figured they had a quick mover when they selected Lowe in the third round of the 2015 Draft. They were right. Although an injury kept the club's No. 10 prospect from making his debut until the following year, he didn't miss a beat and took a huge step forward this season, which ended with him in the Major Leagues. Before earning his call to The Show, Lowe batted .297/.391/.558 with 22 homers, 76 RBIs and 73 runs scored in 100 games between Double-A and Triple-A. "Brandon came into his own this year, both offensively and defensively," Lukevics said. "He's improved each season and really learned how to drive the ball while improving in the field. His versatility is something we look for in our players and Brandon certainly fits that mold. We're not afraid to throw our guys out there at different positions if it helps keep them in the lineup." Right-handed starter -- Zach Lee, Durham (13 starts), Montgomery (13 games, 12 starts): One of the Dodgers' top prospects as recently as 2015, Lee was a different pitcher after making his Major League debut that year. The Texas native posted a 6.45 ERA over 215 innings from 2016-17 and began 2018 with his fourth organization in two years. The result was a resurgence. He went 12-6 with a 3.65 ERA in 26 appearances, including 25 starts, at Double-A and Triple-A. Lee became a Minor League free agent at the beginning of November. Left-handed starter -- Brendan McKay, Charlotte (11 games, nine starts), Bowling Green (six starts), Gulf Coast League (two starts): The Rays' answer to reigning American League Rookie of the Year Shohei Ohtani, McKay continued to excel on the mound as the club continues to wrestle with the question of which position best suits their two-way player. Although he missed a month with tightness in his oblique, Tampa Bay's second-ranked prospect went 5-2 with a 2.41 ERA and a 103-to-14 strikeout-to-walk ratio over 78 1/3 innings in 19 appearances, including 17 starts. "Obviously, he hasn't pitched much professionally, but he's got the stuff," Lukevics said. "He has the ability to throw three plus pitches over the plate, but he's still learning and doesn't even have 100 innings under his belt [as a pro]. The oblique injury he suffered while swinging set him back, but he's got terrific stuff and great command. Then there's the aspect of him as a hitter, which is interesting in its own right, but we haven't made any definitive decisions on his future role at this point." Relief pitcher - Colin Poche, Jackson (nine games), Montgomery (three games), Durham (28 games, two starts): Obtained in an early-season trade with Arizona, Poche finished the year as one of the Minors' best relievers after posting an 0.82 ERA in 40 appearances. The Rays' 24th-ranked prospect won six games, held opponents to a .151 batting average and struck out 110 over 66 innings while walking 19. He was unscored upon in nine appearances with Double-A Jackson in the D-backs organization prior to being moved on May 1.